Over the centuries, the image of France has often swung between the « country of freedom » and the « birthplace of intolerance ». To quote only one example, the Saint-Barthélemy massacre, on 24th August 1572, was the result of campaigns of crazy rumours concocted against Protestants. 30,000 of them perished in a few days throughout all of France. 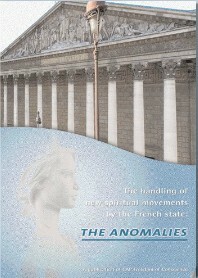 In the 1970s, associations specializing in the fight against New Religions Movements began to spring up in France. Intense lobbying, based on the spreading of fear of spiritual and religions minorities, allowed them to obtain public finance close to the figure of a million euros every year for themselves as well as for the government structures that they inspired. The European Federation of Centers of Research and Information on the Cult phenomenon (FECRIS) was itself founded in France, born of that Franco- French sphere of influence whose action is tainted with intolerance. The FECRIS has become the relay, on a European level, of these campaigns that fight against minority movements. In 2006, the only public financial support for the FECRIS came, in fact, from the French Prime Minister. Militant groups, such as the FECRIS, frequently boast about the French experience which they claim is at the cutting edge as regards the fight against minorities, as it has managed to create government instances and a new legislation to « safeguard against the dangers of the new beliefs ».